FILE PHOTO: This combination of October 2017 file photos shows Pennsylvania gubernatorial candidates Democrat Gov. Tom Wolf, left, and Republican Scott Wagner. FILE PHOTO: Pennsylvania gubernatorial candidates Democrat Gov. 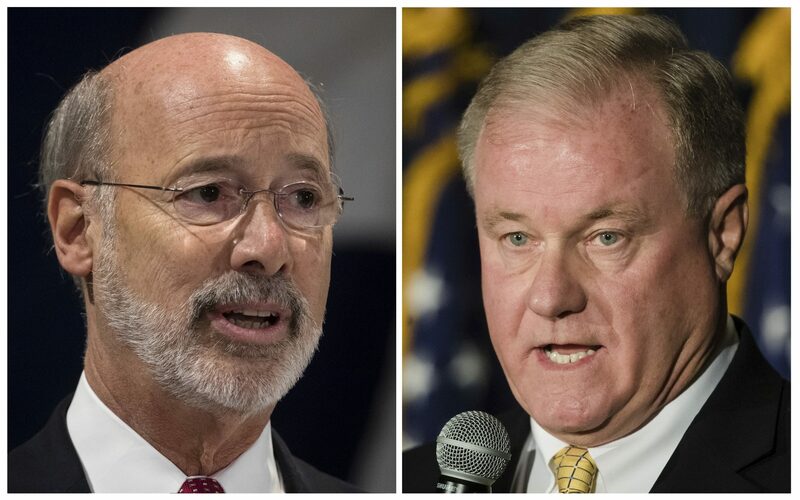 Tom Wolf, left, and Republican Scott Wagner have not made addressing climate change a top priority. A report out this month from the United Nation’s Intergovernmental Panel on Climate Change paints a pretty dire picture. By 2040, the world faces myriad crises — including food shortages, extreme weather, wildfires and a mass die-off of coral reefs — unless emissions are cut sharply. The scientists wrote the report expressly for policymakers. They’re urging governments to try to keep the warming below 1.5 Celsius above pre-industrial levels. That’s half a degree less than the goal set by the 2015 Paris Climate Accord. They conceded that there is “no documented historic precedent” for such a rapid transformation of the global economy. Although Pennsylvania has a small share of the global population, it is an energy powerhouse that is both historically — and currently — a major source of harmful emissions. Among states, Pennsylvania is the third largest carbon emitter. But a sense of urgency on climate change doesn’t show up in the Pennsylvania gubernatorial race. Incumbent Democrat Tom Wolf and Republican challenger Scott Wagner acknowledge climate change is happening, but neither had made addressing it a top priority. Wagner, who built his fortune in the waste-hauling business, was widely mocked last year, when he offered up this explanation for the rapid warming. He stepped in it again over the summer, when a young woman at a campaign event asked him about climate change. He called her “young and naïve”— and was criticized for being both sexist and dismissive of an important issue. The Wolf campaign immediately jumped on the gaffe, handing out bumper stickers that read: “Young and Naïve Voter.” Wagner walked back those comments in August, when he acknowledged climate change exists, but said he couldn’t do much about it. Although Wolf’s campaign has seized on Wagner’s climate comments, the governor has not taken a prominent role in addressing the issue. He has taken steps to curb methane leaks from oil and gas sites and backed measures that promote cleaner energy. He signed a bill last year aimed at encouraging solar power within the state — and another bill to help commercial property owners finance clean energy upgrades. But in a recent interview with the Philadelphia Inquirer editorial board, Wolf falsely stated that he had expanded the state’s renewable energy targets. He could take a look at his 2014 campaign website. Back then, he pledged to introduce legislation during his first year in office that would set higher clean energy targets for the state. He didn’t follow through. The existing law, known as the Alternative Energy Portfolio Standard, requires utilities to buy 8 percent of their power from so-called Tier 1 clean sources, such as wind and solar, by 2021. The law was considered cutting-edge when it passed in 2004, but since then many other states have set far more aggressive targets. Historically, Pennsylvania is a fossil fuel state, says Joe Minott, executive director of the Philadelphia-based Clean Air Council, but given the stark warnings from climate scientists, he says the state should be doing more. Pennsylvania’s Marcellus Shale boom has helped reduce carbon emissions, says Gene Barr, president of the Pennsylvania Chamber of Business and Industry. He takes Wolf at his word that he wants to support and grow the gas industry. In the same Inquirer editorial board interview, Wolf linked his support of the large petrochemical plant Shell is building near Pittsburgh to the need for more renewable energy. The cracker plant will take Marcellus shale products and turn them into ethylene, a building-block for the plastics industry. When it comes online, it will be among the largest air pollution sources in the state. Wolf also has not followed through on a campaign pledge to join the Regional Greenhouse Gas Initiative (RGGI). The market-based system is a collaboration among northeastern states to limit emissions. Wolf denied ever making such a pledge. It was part of his 2014 campaign platform. It’s unlikely the Republican-led legislature would go along with any efforts Wolf might make to cut emissions. But green groups have criticized him for not taking a harder line on the issue. Research shows Pennsylvania voters care about it. In a Franklin and Marshall College/ StateImpact Pennsylvania poll earlier this year, a majority said that climate change is causing problems right now, and the state should be doing more to address it.